Most people believe that the era we live in is totally normal. This is the case whether you live in a war-zone or in “Shangri-La”. It is the same with the economy. Everybody in the West today believes that stocks always go up and that property grows to the sky and that government bonds are the safest investment you can own. So these strong markets have been the norm for the average investor for the last 100 years. Everything they touch has gone up and any down move is only a correction. And so far investors have been right to stay in the market. Anyone who sat on a diversified portfolio of stocks, property and some bonds has made a massive fortune in the last hundred years. Very few skills in picking the investments were required. It was enough to buy high quality investments and just sit on them. Yes, there have been scary moments like for anyone who bought stocks when the Dow was at 400 in 1929. By 1932 the investor had lost 90% and felt very poor. But 24 years later he was breaking even and today, his heirs would own stocks that have achieved a handsome return of 4,400%. Anyone who was clever enough to put $10,000 in the Dow at the 1932 bottom would today sit on a $4.5 million fortune. Hindsight is of course the most exact of all sciences. But the point I am making is that we have seen 100 years of investment markets when no skill was required, just staying power and patience. Most investors have the opinion that it is their skills that is creating the high returns. In the late 1990s for example, every single person was an expert in the Nasdaq and internet stocks. That is until they lost 80-100% in the early 2000s. At that point all the self-made experts vanished completely. The majority of people have got no idea that their gains in all asset markets have very little to do with investment skills but instead all to do with the extraordinary generosity of governments and central banks. Because the creation of the Fed in 1913, started a fool proof method of making money especially for the bankers. And the Fed was a creation by private bankers for the benefit of private bankers and major investors. As Mayer Amshel Rothschild said: “Give me control of a nation’s money and I care not who makes its laws”. So in 1913, an absolutely extraordinary period of 100 years started that has led to a total explosion in most asset classes, population numbers, inflation and credit growth as well as medicine and science including some amazing technical innovations and developments. There is of course nothing wrong with rapid growth. But when it becomes exponential and relates to a bigger sample like the world or a major continent, the likelihood is that it won’t last and that there will a substantial move in the opposite direction. World population to decline by billions? Let’s take the example of population growth. 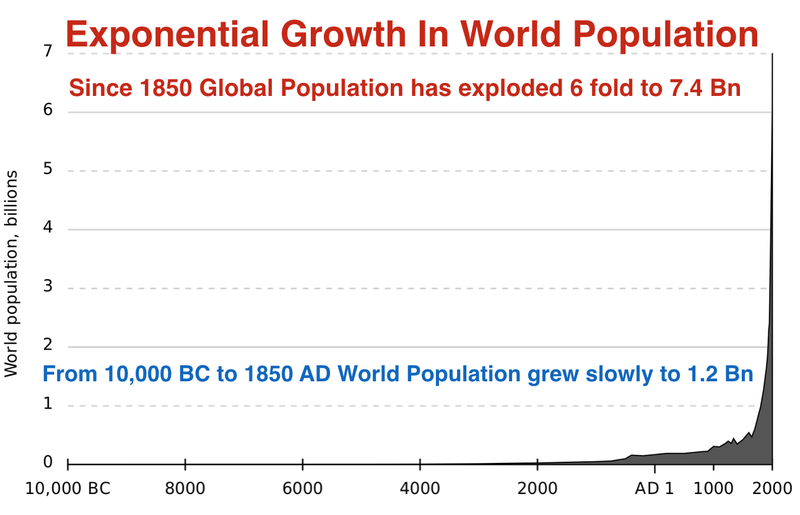 For almost 12,000 years, global population grew gradually to reach 1.2 billion people in 1850. It then reached 1.4 billion at the turn of the 1900s. But since then, as shown in the graph below, there has been an absolute explosion to 7.4 billion currently. Prosperity, food and improvement in medical science have all contributed to this exponential growth. Experts are now forecasting that global population will double to 15 billion by 2100. This is in my view very unlikely. If we look at the 100-year spike on the graph, that is likely to end abruptly at some point. Yes, population can continue to grow for a number of years but spikes or exponential growth never continues straight up and doesn’t just pause with a sideways move. Instead a spike move will eventually result in a spike in the other direction. So at some point world population will come down by say 30-50%. This sounds implausible today, but remember that throughout history there have been events that have resulted in a major reduction of humans on earth. Take the Black Death in the mid-1300s. It is estimated that up to 40-60% of Europe’s population were killed and maybe as many as 200 million worldwide. Disease is only one way which can reduce the population. War and economic depression could also have serious implications on the size of the population. A nuclear war could be totally devastating and collapse of the financial system would lead to famine. I am not forecasting these events, but the probability is major that one or several of these disasters will happen at some point in the future. Another unsustainable trend is the explosion in US inflation. 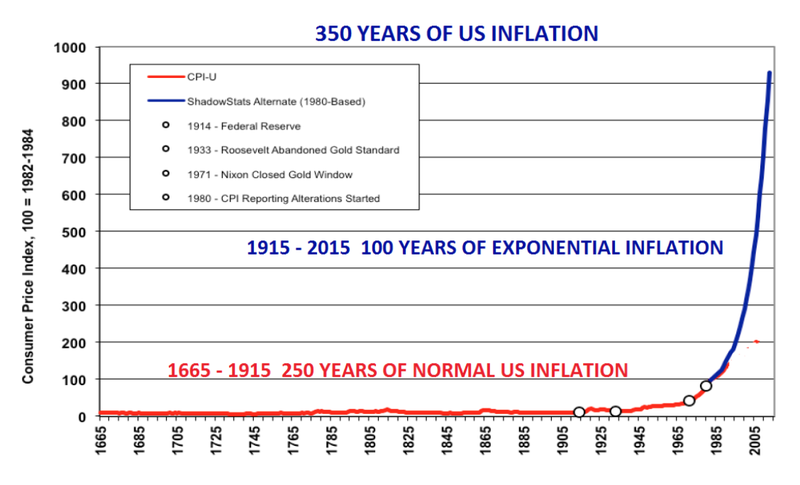 Between 1665 and early 1900, US inflation was on average maximum 1-2% p.a. Then from 1913 with the creation of Fed, the credit explosion and money printing started. Initially it was gradual but from 1971, when Nixon abolished the gold backing of the dollar, inflation has gone exponential and so has credit growth. I know that many people will argue that we are not seeing any inflation in the US or the world economy and that we currently have deflationary pressures. There are a few reasons for this. The first is that governments deliberately skew the inflation figures so that they are totally misleading. Secondly, the credit created and the money printed does not go to the ordinary consumer. Instead it goes to the banks and major investors. This has led to the most massive asset inflation that the world has ever experienced with the explosion of stock, property and bond prices. Just like the population bubble, the exponential growth in inflation will not last. But before the bubble bursts we are likely to see one final and futile attempt by governments and central banks to try to save the world economy and financial system by unlimited money printing in the trillions or even quadrillions of dollars. So another spike in inflation, leading to temporary hyperinflation is likely before it all implodes in a deflationary swoon. The third spike is the explosive growth in global debt. This is what has created the mess the world is currently in. Central bankers took Amshel Rothschild’s words to heart but then they turned too greedy until they totally lost control of the monetary system. And that’s where we are now. Together with governments, the bankers have now created disastrous vicious circle that is spiralling down at ever increasing speed. Exploding government deficits and debts and the insolvency of the banking system combined with zero or negative interest rates have produced a situation which central bankers have not got a clue how to deal with or solve. The only solution they know is to apply the same method that created the problem in the first place, namely to print more money and issue more debt. 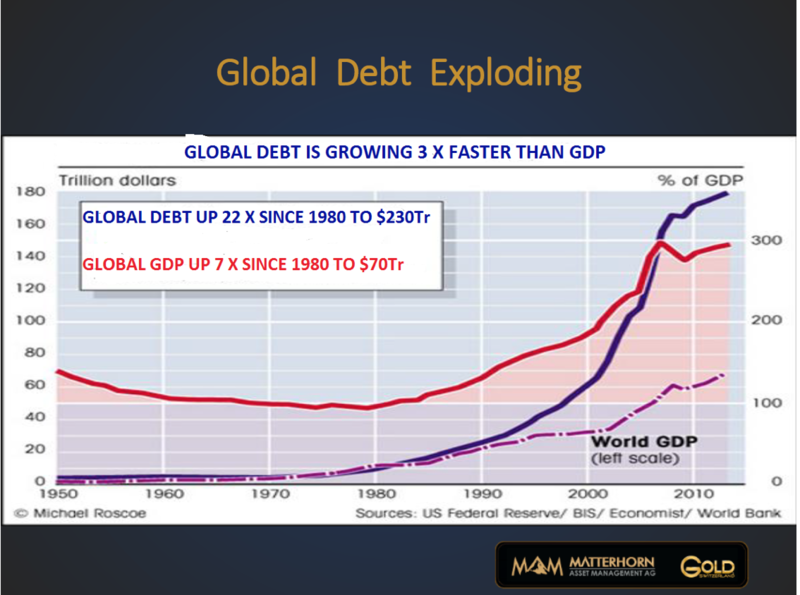 Just look at how global debt has exploded 22 times in the last 35 years from $10 trillion to $230 trillion today. At the same time global GDP has gone up 7 times only. We could call it the law of diminishing returns if we want to be kind. More and more credit is needed to create an increase in GDP. But if we want to be truthful we should call it the biggest disaster that man created throughout history. The world cannot continue to grow naturally before the current debt of $230 trillion together with the $1.5 quadrillion of derivatives have all disappeared. This must and will happen at some point in the not too distant future. The result will be an implosive depression that will make most debt disappear and assets such as stocks, property and bonds to decline by 90% or more. Of course that seems impossible today but the spikes in the charts above all indicate that this is likely. And based on logic this has to happen. It is only a question of when. The consequences will be totally devastating for the world economy and for almost all human beings. A lot of people will die prematurely for the reasons discussed above. It is clearly impossible to protect yourself against all these risks. Close family and friends is always the best protective network in times of crisis. For the privileged few who can afford to acquire some physical gold and silver, this has throughout history been the best financial insurance to own. The precious metals have now started a sustained and very strong up-move. Tagged exponential growth, global debt, hyperinflation.